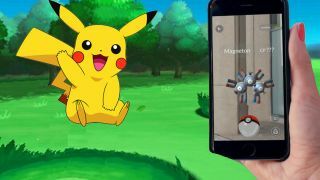 After an upgrade to the massive Hall H to cope with all the people who wanted to attend the Pokemon Go panel at Comic Con, Niantic CEO John Hanke teased some future updates for the app and revealed some more concrete information. Reported by Comic Book, everyone thought a Legendary Pokemon might be rocking up in San Diego, but Hanke let the audience down gently. More excitingly, he revealed that of course the Pokedex is going to get bigger as the app evolves. "There are a certain set of Pokemon in the game right now. There are some rare ones that haven't showed up yet that will be showing up. And there are some other ones in the universe, it's something we're excited about continuing with in the coming years," Hanke said. He also officially confirmed the Easter egg where you can control the evolution of your Eevee in Pokemon Goas being just one of a number of secrets we haven't found yet. Right now, there is a probably far too many people piling names into Pokemon Go and seeing what happens. Hanke also teased new Pokestop functionality that could mean landmarks becoming more useful than just loot caches and being more like Pokemon Centres where you can heal injured Pokemon. In more concrete info, he also revealed the Team leaders who will apparently be cropping up further down the line and giving advice instead of just leaving us to battle over train stations alone. Team Mystic's head is Blanche, Instinct's is Spark and Valor's is Candela. It doesn't feel like any of these updates will be coming any time soon though. Hanke admitted that the team wasn't ready for the success of the app and is concentrating on just keeping everything running without crashing. Apparently Niantic is "aware" and working on the current three step problem where it looks like all Pokemon are three paws away. It's still ridiculously exciting that this is only really the beginning of the app. If you're just starting, here's some Pokemon Go tips.